Turbidites (interbedded with mudstones/siltstones) from the Ross Sandstone Formation Turbidite system of Namurian age in County Clare, Western Ireland. The sandstone beds were formed in a deep basin by turbidites coming from a delta area. 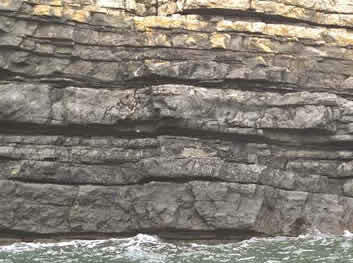 Turbidites are sea-bottom deposits formed by massive slope failures where rivers have deposited large deltas. These slopes fail in response to earthquake shaking or excessive sedimentation load. The temporal correlation of turbidite occurrence for some deltas of the Pacific Northwest suggests that these deposits have been formed by earthquakes.